It doesn’t take a personality test to tell that I’m a “people person,” but I’ve taken enough of them to have it officially confirmed over and over. From StrengthsFinder to DISC, people-skills rise to the top of every aptitude assessment I’ve completed. It should come as no surprise then that I’m keenly interested in understanding how people relate to each other in social networks. In my work, I am constantly reflecting on how central relationships and networks are to all we do. Whether it’s the kinds of relationships providers and patients develop with each other, or how health systems interact with their community, or how a new technology gets deployed to the far reaches of our state, success depends on our ability to develop and build connections. So, the ability to understand and measure the depth and quality of the relationships in our networks is important. 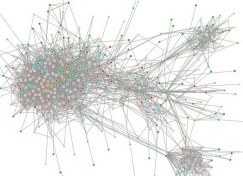 Social Network Analysis (SNA), or the science of investigating social structures, is gaining traction as a powerful tool. The health care industry is complex and highly competitive. Economic incentives are often out-of-alignment with population health needs. To overcome these forces, there is increasing evidence that we need strong relationships across sectors. Since 2012, CCMU has convened a statewide network of multi-sector health alliances called the Colorado Network of Health Alliances. For the past two years, we’ve used SNA tools, like PARTNER, to measure the strength of the Network and develop strategies for building stronger relationships between members. These tools allow us to understand which people in our networks are major influencers or who might hold the relational key to a group of individuals we’ve been trying connect to. SNA tools also allow us to measure progress on the intended “soft” outcomes of collaboration and network-building strategies. These indicators, like network density and process quality, have been linked to improved efficacy and duration of community health interventions and improved outcomes of population health collaboratives. To have the greatest impact on Colorado’s health care system and population health, local leaders must have the tools and capacity to effectively build strong networks, implement collaborative strategies, and evaluate their progress. SNA tools are a great start. Being labeled a “people person” sometimes comes with a negative association, because relational skills are often seen as less valuable than analytical or technical skills. Fortunately for everyone with these people-centered strengths, relational skills are hard to program a machine to do, so they’re becoming more valuable these days. As SNA tools also gain traction, I can now measure and understand my skills’ worth! Want to test out an SNA tool? Explore the connections between your LinkedIn contacts Socilab.